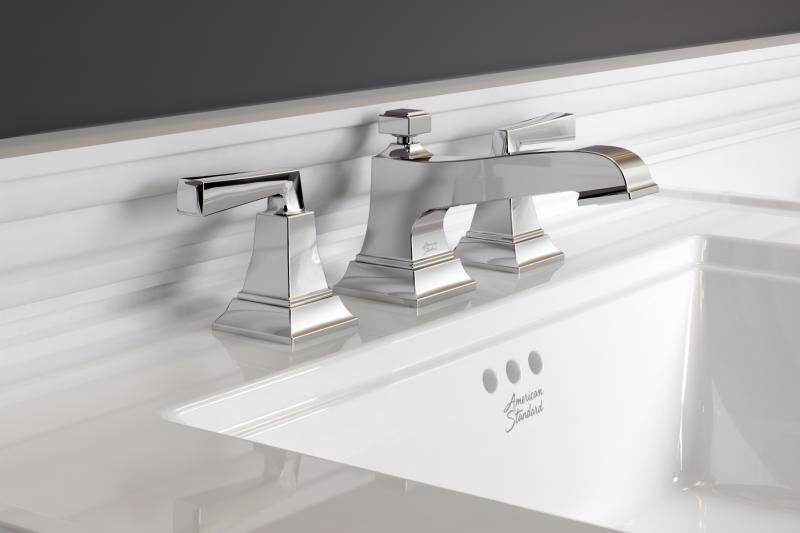 American Standard’s new Town Square S Collection of bathroom fixtures and faucets draws inspiration from classic American architecture but with modern technologies and conveniences. Town Square offers a soaking tub, an apron-front tub, lavatory and shower faucets, sinks, and toilets. 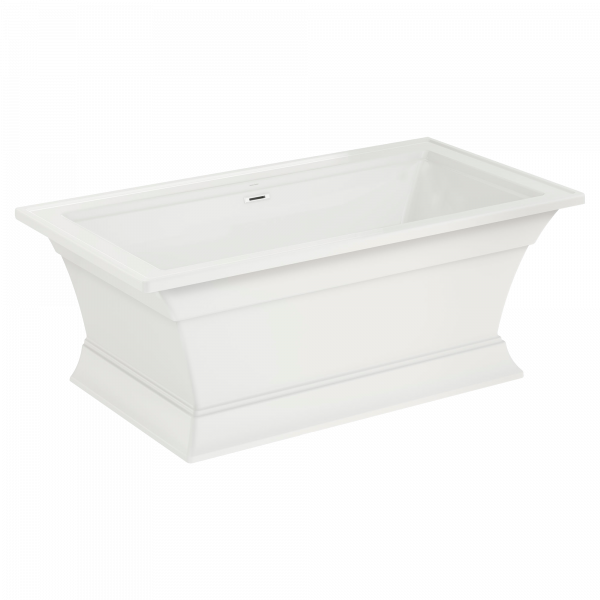 The Town Square S freestanding soaking tub offers a three-sided design that allows it to be installed flat against a wall or placed in the center of the room. When installing the tub with a deck mounted tub filler, the installer can easily access the plumbing lines through a removable access panel located on the back. For added design flexibility, the collection also offers a spacious apron-front tub that comes in two remodel-friendly sizes that fit a standard alcove. Each includes an integral three-sided tile flange to help contain the water and prevent seepage into the walls. 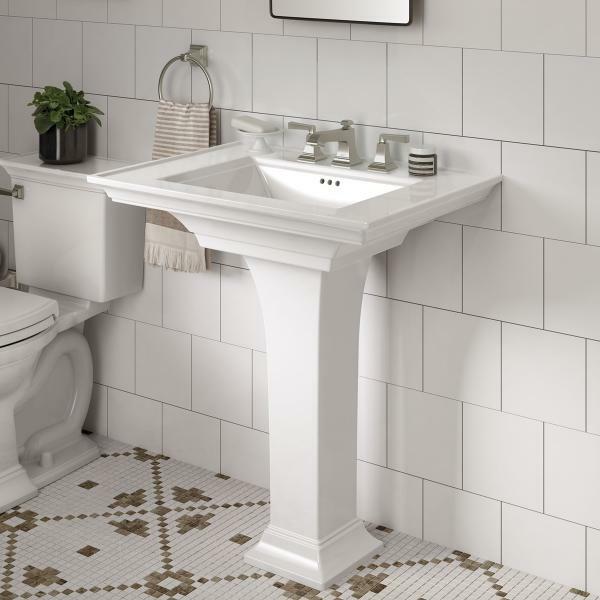 Offered in single-hole or 8-inch centers, the Town Square S pedestal top can be installed on a pedestal leg or a metal console, while the vanity top can be installed on a wood washstand with towel bar. The metal console and wood washstand are both offered in a choice of two finishes. 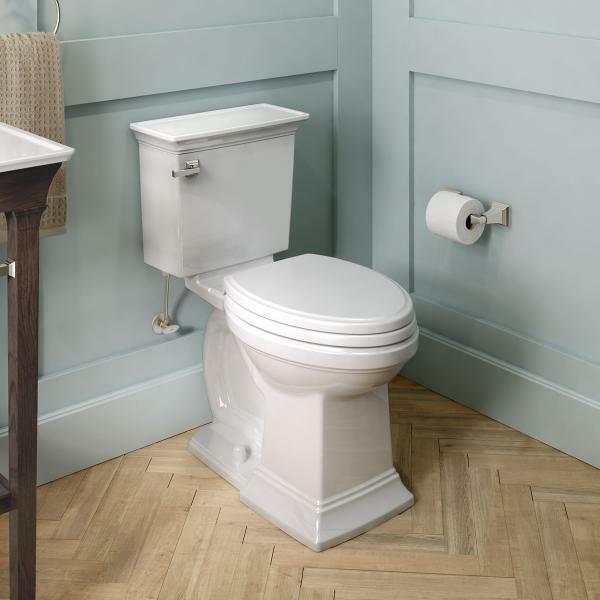 The two-piece high-efficiency elongated toilet meets WaterSense-certification requirements by using 20 percent less water than standard 1.6 gallons per flush. It also comes with EverClean, a feature that inhibits the growth of stain and odor-causing bacteria, mold, and mildew on the surface, the company says. Constructed from brass alloy that is certified lead-free, Town Square S faucets incorporate pressure-compensating aerators to deliver a flow rate of 1.2 gallons of water per minute. Products also incorporate easy-to-use, push pop-up drains with fewer parts than a standard drain, the company says. A selection of sink and shower faucets in various configurations are available. Products are available in polished chrome, polished nickel, brushed nickel, and legacy bronze.